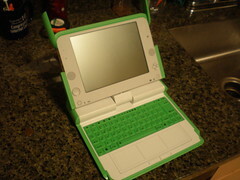 So I just got my One Laptop per Child (OLPC) Give One Get One XO Laptop and I love it. It’s such a wonderful little computer. While i’ve worked with some early betas of the laptop, this is the first time i’ve gotten my hands on a production version of the hardware. I look forward to doing a deep dive into the software and what it’s capable of. I’ll definitely be writing about it more in the future. You too should give one and get one of these xo laptops. There are only a few days left to participate. The program ends December 31st, 2007. So donate right now. If you already have your OLPC XO laptop and live in the DC area, we’re going to do an impromptu get together this weekend at 2:30pm at Murky Coffee in Arlington, VA.
It’d be great to get a bunch of these computers together, demo what they’re capable of, and see how many other people we can get to buy them. @Wayan, thanks for the pointer… done. Previous Previous post: Wanna Help Stop Rumors… Be Transparent. Give people some real news to talk about.